This is a short description of the Amazing Race ebook. Have you wanted to hold an Amazing Race at camp, but you didn’t know where to start and it all seemed so daunting? Then this ebook is for you. Having an Amazing Race can be a very memorable and enjoyable program for campers and staff alike, and it doesn’t have to be difficult to design. 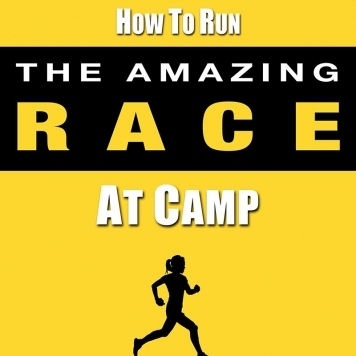 How to set-up The Amazing Race for your camp. This can be a great team-building program or a just-for-fun event. You can run The Amazing Race for young kids, teens and even families. Don’t spend countless hours trying to figure everything out and creating clue cards. This ebook was written from my experience running Amazing Race programs at camp, both on-site and off, and from the experiences of other camp professionals I have spoken with. This ebook will be a great resource for you. Get it and you’ll save not only valuable work hours but your sanity as well. What is your time worth? This ebook will save you many, many hours creating a new type of program. The ebook and the templates are in PDF format. All you need is Adobe Acrobat to view them, which is standard on nearly all computers these days. A link will be available right after your purchase. The link will also come to you in an email. Great resource for folks new to Amazing races or those looking to spice up what they’ve done in the past. Lots of inspiration with dozens of challenges and roadblocks to get you started! Plus there are templates for the cards which is such a bonus element to this – it’s all in the details! Love this document! I’ve only used it twice at my summer camp for kids/adults with special needs but I’ve also used it three times with my yearly social groups for kids/adults with Special Needs. Thanks so much! We utilized this book at the Rosen JCC to help us better run our Amazing Race program. The book was very help to making our program more robust. In particular setting up road blocks and additional challenges along our course was really great. We wrote a 2 hour program for 100 traditional campers to play in on afternoon at camp Thank you!